Thank you so much for all your kind words and concern and well wishes after that last post. I truly appreciate it all and I hope never to have to repeat it! With that, I’m going to just get right back into the swing of things, because well, that’s the best way to go about it right? And what better way than to jump back than with a spot of colour. 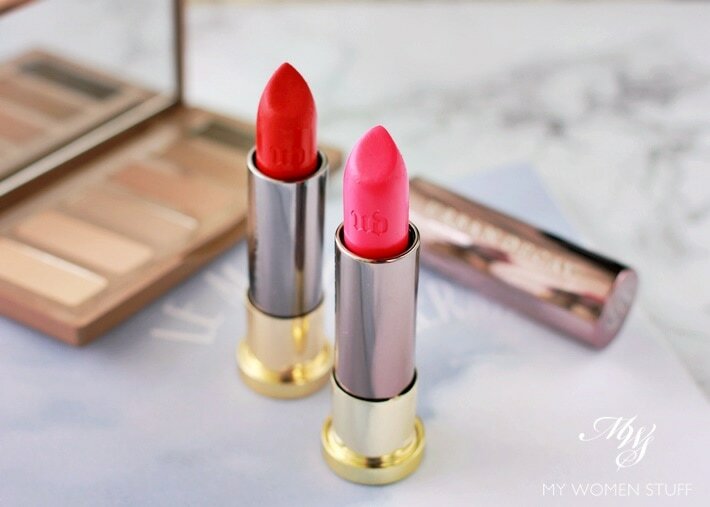 The Urban Decay Vice Lipsticks were launched a few months ago with a mind-boggling array of over 100 lipstick colours in 6 different textures. I don’t have them all, naturally. I wasn’t important enough to be seeded nor offered to try, but they interested me for one simple reason – they were actually pretty affordable. Well, I use the word “affordable” loosely, because it still is pricey at RM70 (US$17), just less so, compared to many new lipstick launches from all the major brands. I eventually scored 2 samples out of the whopping 120 shades available (I’m told that not all are available here yet – they’ll trickle in) in the Vice Lipstick range, that basically supersedes and revamps the whole Urban Decay lipstick lines. Before I tell you about the product, I’m going to make one observation. I’m not crazy about the packaging, which brings to mind a bullet. In this age of irresponsible gun ownership, I am perturbed that a brand, even one who courts controversy like Urban Decay, would take this bold step to design their lipstick to mimic that of a bullet casing. I felt they should have been a little more responsible in this regard. Otherwise, the packaging, which has a metallic feel to it, is very light and a little flimsy. At those prices, I am not expecting the heft that comes with a Dior or Chanel, but it does surprise me how flimsy it feels. I almost feel like I can squash the cover, which has a light aluminium texture about it. In fact, the cover of one of mine is a little dented from travelling through the post – tells you about the construction. The 2 shades I was sent were 714 (Mega Matte) and Crush (Cream). These were 2 textures out of the 6 available. The others are Comfort Matte, Sheer, Sheer Shimmer and Metalized. They are all permanent, and will replace all the ranges of Urban Decay lipsticks, so there is basically just one range, you just have to decide which texture you like. 714 Mega Matte – This is the red that you see in the picture, a shade I will wear. It is a bold, opaque red that is intense and eye catching. However, the Mega Matte texture lives up to its name, in that it is VERY matte when worn. 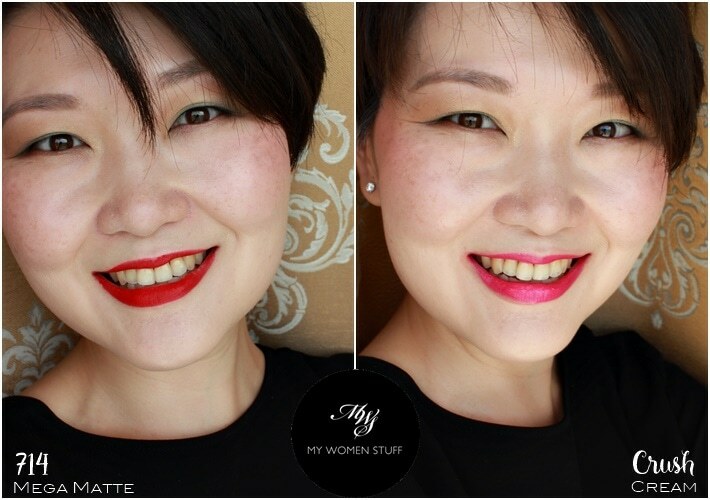 If you like matte lipstick, then this would be the one you want to consider. It has a flat matte texture that I personally find drying. However, due to the matte texture and opacity and pigment, this one lasts for hours and hours! I wore this all the way through a 3 course meal and drinks and did not have to touch up at all. It felt a little uncomfortable in the end, because I could feel the dryness on my lips, but if you want something long lasting, this is it. Be sure to ensure your lips are flake free, and because it is a little dry, it pulls on the lips and doesn’t apply as smoothly as it should. Crush Cream – Ok this is the texture I like in a lipstick. It glides smoothly with a lovely creamy texture that isn’t too heavy, and neither is it too emollient as to travel. Longevity is good, but it doesn’t last quite as long as the Mega Matte one does. It feels infinitely more comfortable on the lips than the matte, and I liked how it looked, with a slight sheen that I find more flattering. The problem for me, is that Crush, which is a bright, warm fuchsia pink is not a colour I’d normally wear. The problem with bright pinks like these is that it makes teeth look incredibly yellow and unhealthy, and I just don’t favour that kind of pop of colour, which I feel contrasts too strongly with my skintone. In a different colour I think I might have enjoyed this formula a lot. The pigment and opacity cannot be beat however. These swatches were made with just 1 swipe straight from the bullet on my hand. They are incredibly pigmented, and opaque right from the get-go, and that is impressive. I would have been much more forgiving had 714 been in a cream formula, because I can imagine how much more comfortable and better it would look when worn. For an idea of how both these lipsticks look when I wear them, here’s a full face look. If you’re wondering why I didn’t touch up the 714, which looks a little patchy, it’s simply to show you that it will apply this way. The dry matte texture pulls and tugs at your lips when you apply straight from the bullet, and I find that you have to be careful if you want a smooth outline. That’s important in a colour as bold as this red, which I still think would look and feel much better in the Cream formula. I find it interesting, if not disturbing, that since these launched in the middle of the year, I haven’t seen much hype or posts or mention of the Vice Lipsticks in recent times. It’s like the whole social media buzz was a mere flash in the pan with no lasting effects on the consciousness. Fickle are thee, influencers! The Urban Decay Vice Lipsticks are a permanent range of over 100 lipstick shades in 6 textures. It will replace the existing ranges of lipsticks under the brand. Of the 2 that I have, which are in the textures Mega Matte and Cream, I prefer the Cream texture. It glides smoothly and gives lips a nice shine, while being long lasting. 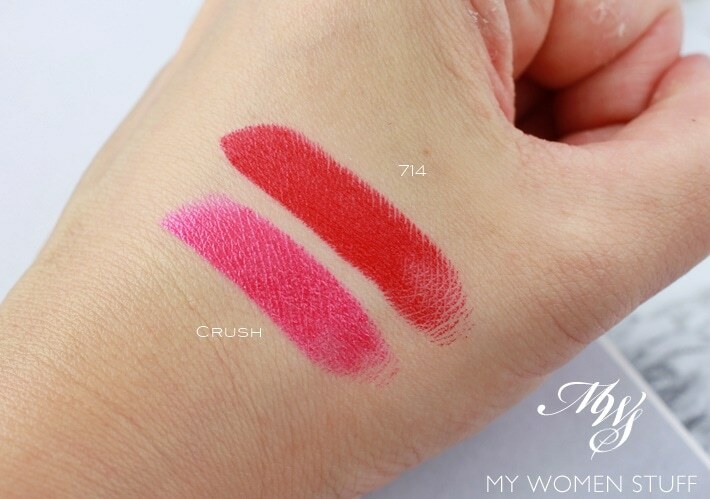 The Mega Matte texture, as the name implies has a velvety matte texture which is flat, and drying on lips. However, the longevity is very impressive as you can wear it for hours and through meals without having to touch up. Both textures boast a very opaque and pigmented colour, and are impressive, especially considering the fairly affordable pricing. I would be interested to check out one or two of the other textures just to see how they fare, if I were in the market for some intense lip colours. Did you check out the UD Vice Lipsticks and which texture do you prefer? NEXT POST: Your Say: What’s your favourite type of facial cleanser? I tried Liquid here in Melbourne and I loved it! (I feel like it’s a dupe for Clinique’s Black Honey) Sadly though, UD here is so expensive! The Vice Lipsticks sell for AUD28 here and that’s close to RM 90, which I refuse to pay, knowing that they’re RM70 back home. So, you can say that I’ve been really good here! Have tested these out, but finding the shade I want in the texture I want is a little difficult. You’re right, the packaging is irresponsible. Haha I cannot help but noticed how you keep using the word “affordable” for a RM70 lipstick here. ;p Maybe it’s just personal preferences, but for someone who drinks a lot of water throughout the day (and eats of course), I usually don’t go for pricey lip products. They hardly stay long on my lips so why bother? As for those unconventional shades; even if I need a green lipstick (for whatever reason), I’d definitely buy a cheap one since I most probably won’t be wearing a green lipstick often eh? 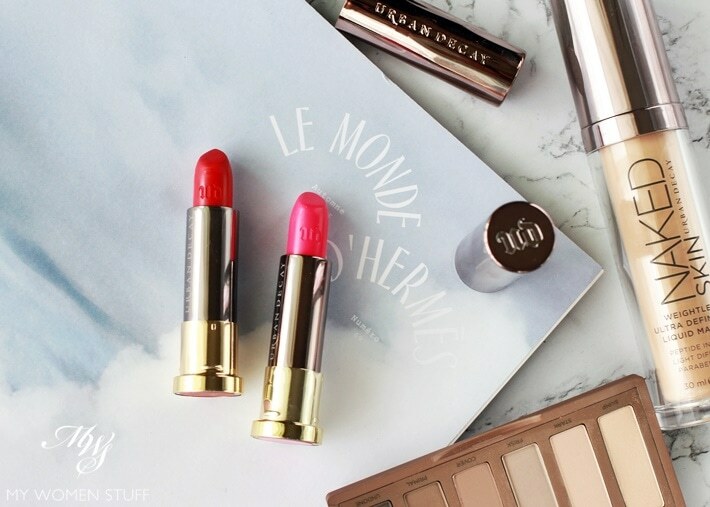 But, I’ll definitely gonna try out some of these lipsticks on my next visit to Sephora! On Saturday my sister and I tried them out on Sephora, she went with the blue one which actually didn’t look bad but it was a comfort matte and it was so complicated to use (I don’t know if the problem is also that I suspect they’re drier because they don’t have the, cap? on). I tried Sheer liar and it was lovely creamy with a see-through color but now I don’t now if they’re better than MAC lipstick because they cost the same in Mexico. Also you have a good point about the bullet form, they should have been more concerned about the violence we have now; although I should admit that I didn’t really care about it until you mentioned it. Haha the bullet thing surprised me, considering it’s an American brand and I just expected a little more PC-ness coming from them. But then, I suppose that PC-ness was never really there to start with. I don’t use MAC lipsticks so I won’t be able to tell you how they compare. I did like the creamy texture, that much I know. But the colour selection, for all it’s 100+ shades, can be a little weird. What’s PC-ness PB? Political consciousness?